I just took out 400 BGN (aka. Leva) from the local ATM machine here in Sofia. This would be my 5th consecutive cash withdrawal in 5 days. Why you might ask am I taking out so much cash? Well, it’s to pay my rent, which I do every three months. One of the fun things I have adapted to here is the fact that Bulgaria functions primarily as a Cash Economy; meaning hardly ever are credit cards accepted and checks just don’t exist. 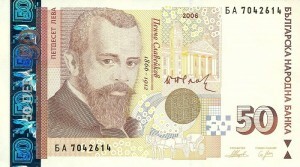 As a member of the European Union, eventually Bulgaria will adopt the Euro as their currency, but as of now the economy is not strong enough with the exchange rate being 2 to 1 (20 Leva/BGN = 10 Euro). The idea of paying in cash was a very difficult concept for my father to grasp when my family was visiting. He was quite annoyed that he was unable to use his credit card at almost every restaurant we went to in Sofia (including chains like Dvatka & Ugo) and more so when we had to pay for our train tickets to Istanbul in cash. Now, I’m not saying that I’m completely used to this concept yet. After 4 months I still hate having to take out the maximum withdrawal amount of 400 BGN every day so that I have enough cash to pay my rent for Dec, Jan & Feb. More so, I hate when the machine spits this enormous sum out at you in 10 Leva bills – leaving you with a huge wad of cash. And then there is the day I need to walk carrying over 2000 BGN in cash to my landlord’s office. I don’t know about you, but I still feel insanely uncomfortable carrying around that kind of money while walking down the street. When it comes to larger purchases and rent payments I definitely miss being able to use a check or credit card, but using cash for smaller every day expenses is not bad. I will admit that in the States I was one of those people who would use her debit card to pay for a $4 lunch or $2 cup of hot chocolate/tea. Here in Sofia, when I take out 80 BGN from the ATM I am responsible for making that money last and it is easier for me to track how I spend it. On a daily basis I use cash for everything: grocery shopping, lunch/dinner, taxis, bus fare. I even walking to the Cable Company’s Office once a month to pay my cable/internet bill in cash. Now, I’m sure most of my family and friends from generations before me are laughing because they remember and lived in a world without credit cards, but for Gen Yers like myself who exist in a digital world, do online banking and pay their bills electronically this is definitely a new experience.